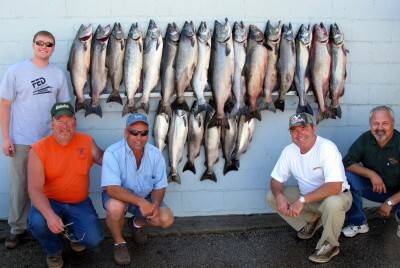 We fished up north in 80 to 120 FOW today. 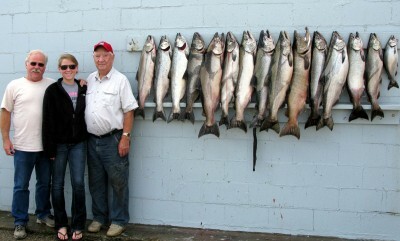 It was tough to leave the peir heads after the great fishing we’ve had there the last two days. We didn’t mark many fish there when we went out this morning and we afraid of going to the well one too many times. Boats that did fish there today did catch fish. Our fishing this morning was about as good as it gets. We had our fish by 7:30 a.m. We had our out downs set at 50 & 55 ft. with mag spoons and the chute rigger at 60 with a 10′ White Glow Blade Spin Doctor & Green Mirage Strong Fly. Our wires were out 150 on the highs & 110 on the lows. We had a 10″ Glow Blade Blue Bubble Spin Doctor/Blue Moo Big Water Meat Rig & 10″ White Crush Mountain Dew Spin Doctor/Cold Steel Big Water Rig on the highs and a 10″ Showtime Spin Doctor/Moo Moo Big Water Rig & a 10″ Black Crush Spin Doctor/Moo Moo on the lows. We had DW Captains Choice Natural Glow Cut Plugs on our 10 color cores. They each took a fish but once they went we couldn’t get them back out because the action was so hot. The mag size Dreamweaver Beefeater was our best spoon. We set in the 01’s and finished up in the 04’s. 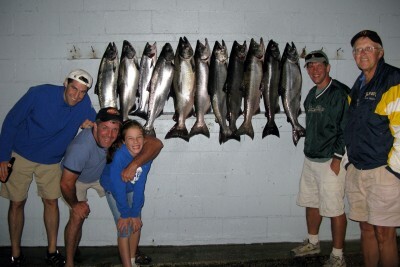 We fished our last three trips at the pier heads, a double yesterday and a morning trip today. The action was great. We usually go north to fish off the bank, but we were marking so many fish outside the piers we had to check it out and we are glad we did. 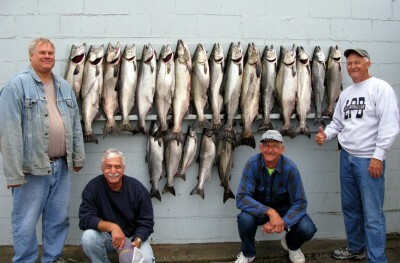 We fished in 30 to 50 FOW less than a mile either side of the pier heads. We were running 3 & 5 color cores, 3 riggers and 4 divers. Our best plug was by far the Dreamweaver Natural Glow Captain’s Choice Cut Plug. We had it on our 3 color cores and ran it on two of our riggers early and late in the day. The Green Black Ladder Back Captain’s Choice Cut Plug was go0d on a 5 color core and 18 feet down on the chute rigger. We were running 10″ Spin Doctors and Big Water Tackle Meat Rigs on our wire divers yesterday and on our low wires today. We ran Slide Divers with mag glow spoons out 70 & 75 ft. in the high position today. A Mag Dreamweaver Beefeater was our top spoon. Our best diver set-up was a 10″ Glow Blade Blue Bubble Spin Doctor/Blue Moo Big Water Rig out 80 ft. on a high wire yesterday and out 40 ft. today on a low wire. We were using regular size Dipsy Divers with the standard ring turned to 3 1/2 for our high divers and a regular size Dipsy with a medium ring turned to 2 for our low divers. The water was a litle warmer today, but the action was still very good.